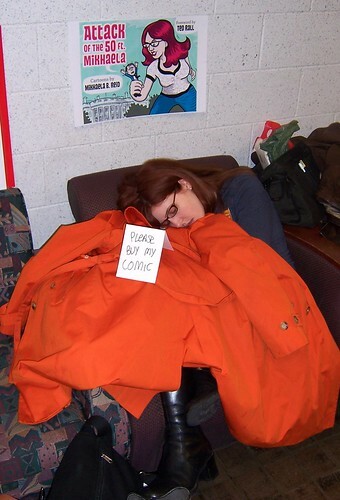 Taking a nap under my orange (RTW, not me-made) trench coat in 2007 at a comics convention in Philly; cartoonist extraordinaire Keith Knight helpfully put this sign on me and I sold some copies of my book in my sleep. Dear readers, I am TIRED. You may have noticed an extreme slowing of actual finished sewing output from me, and you would not be wrong. At 34 weeks pregnant, everything is just DIFFICULT, sewing not excepted. No compression stocking known to woman or husband-administrated massage (thanks sweetie!) seems capable of keeping my feet and legs from swelling to twice their size by the end of the day, and limping up and down the subway stairs and trying to keep fellow riders from jostling me in my ever-so-heavy belly is just NO fun. And repeatedly hearing things like "you're huge! ", "are you SURE it's not twins?" and "you must be ready to go any day now!" from random strangers is just NOT helping. (Random side note--I don't know how it is elsewhere, but 90% of the time in my anecdotal experience when someone offers me a subway seat it's a woman--most men seem to have a method of using their books, Kindles or iPods to pretend they don't see pregnant, disabled or elderly folks who are supposed to take seating priority). The exciting part is--Cartoonist Baby will be here in just 3-7 weeks! Wow! If I wasn't still working I would just sit around on the couch all day watching my belly jump and move--she's an active little girl to say the least, and what before were just kicks and jiggles are now clearly little baby limbs. I just feel constantly overwhelmed with love for her, and can not WAIT to meet her and hold her and kiss her little baby head and smell her baby smell and... wow! But alas, there's a lot of work to be done! Masheka--aka the Best Husband in the Universe--has taken on more and more and more of the housework (and he was already doing a solid majority before I was pregnant) as I've gotten more unwieldy, uncomfortable and sleepy. I'm basically just doing the cooking and some light tidying up at this point, but I am still helping out with our massive apartment decluttering and decorating project and any chores or to-dos that don't require moving heavy objects or standing for lengthy periods (like finishing up putting together the tax information for our freelance business--we had to get an extension on it for the first time this year, oops!). Not that we're unprepared--I am a woman of many checklists! We finished up with the childbirth, birth center, breastfeeding, infant care, babywearing and cloth diapering classes, and will be done with all such educational things after our baby CPR/safety class next week. My midwife visits have gone from monthly to biweekly, and will soon be weekly. The "go bag" is in progress. We've got a likely pediatrician lined up, and we've got the bassinet, clothes, cloth diapers, a car seat (not that we have a car, but we'll need it for the cab ride home from the hospital), a breast pump, and all sorts of assorted baby gear from our generous friends and family. I've requested my 12-week FMLA leave (to start when Cartoonist Baby arrives, or at my due date, whichever comes first), and Masheka has put in for six. So blogging and actual sewing here might become lighter (or at least less verbose) for a little while--and at some point in the next two months, there will be an indeterminate period of radio silence. I hope you won't go away for good! But do not despair--as promised, I finished my reversible skirt, and the cardigan is almost done as well. I'm hoping to photograph them tomorrow. And the lacy hand-dyed baby sweater is coming along surprisingly fast considering my sporadic knitting pace! Take a huuuuuge break! Starting now! I remember those last days (and then the first weeks). I didn't know it was possible to be so tired. Sounds like you are well prepared though. Get some rest and we'll all be here when your blogging maternity leave is over! All sorts of people will say, "Oh, you're eight months pregnant! Here, sit down/don't pick that up/take a nap/eat this chocolate". No one EVER says, "Oh, you have a three month old who hasn't slept in three weeks and is rapidly making you ponder how to join the French Foreign Legion! Here, sit down/don't pick that up/take a nap/eat this chocolate". Try a 15-min warm feet bath of juniper berries at the end of the day. Make sure you let the berries stay in the water for a couple of minutes and press the oil out in the water first. You only need 5-6 of them. It worked for me. My advice is to sleep as well, but understand that anything you have planned to do, and are delaying it until after the baby is born because you think you'll have more time (I thought that), IT'S NOT TRUE! Do it now, if you have the energy. But naps are fantastic, try to take at least one a day. I'm a few months behind you and already feeling the limits on what my body can do. I totally hear you on the slow down in productivity, the excitement, the strangely overwhelming love for someone I know only from kicks and squirms. Wishing you the very best in the last weeks of your pregnancy and the beginning of motherhood! exciting! good to hear from you, hope all goes well! Love your blog, and your comics! Take a break! I'm just starting my second trimester, and I'm crossing my fingers that I'll be as productive as you have been in the next couple of months. No worries about decreased productivity- you're creating LIFE! You're actually working harder than ever right now! very excited to see and read about your baby when she arrives!